"The Oak Ridge Boys have had the opportunity to share the stage with Moore & Moore many times over the years. It has always been a sheer joy to watch them work. These talented and beautiful sisters have never let us down - always professional in every way, and always treating their audience to a first class, energetic, fast paced show that everyone in the family can enjoy. On behalf of my singing partners, Duane, William Lee and Richard, we urge you to give these All American Girls a shot at winning you over... They will do just that!" "These two siblings have got the country duo down pat. They wrote or co-wrote all twelve tracks on their new CD release, and it's a doozy! Great harmonies, and the gals can rock it with the best of them!" "Magical Duo. Love these girls." "Sassy, bluesy, good harmonies, fine dobro-laced production, excellent backbeat. Right in the groove, sisters. This deserves major airplay. Send more and more by Moore & Moore." "Opening act Moore & Moore scored a hit with Friday's fans with its polished set - featuring everything from honky-tonk twang to uptempo country and swing, laced and lavished with twin sisters Carrie and Debbie Moore's perfect harmonies, sounding reminiscent of The Judds." "Gentle, shuffling vocal harmonies drenched in pedal steel..."
"Love the album. Fantastic harmonies". "Traditional country at its best". "These guys always impress me with their likeability and very good songs". "In the finest tradition of discovering new talent and bringing it along with them on the road, the Statlers have found a gem in Moore & Moore. The sisters' harmonies and easy stage presence should snag them that big break they're looking for." "Excellent duo, great performance. Very good harmony between the two artists". "Moore & Moore is the best duet I have heard in a very long time. I think these girls really deserve to go to the top". Nashville, TN (July 2014) – Award-winning country duo, singer/songwriters, Moore & Moore (Debbie & Carrie) will perform at Country Fest Maine at the Litchfield Fairgrounds in Litchfield, ME on Saturday, August 2, 2014 at 7:30 p.m. The unique duo will play a very entertaining 90-minute show. Having sung together all of their lives, there is something really special about the close-knit harmony they create. Adept at working with an audience and making them part of their performance, Moore & Moore give the all out kind of show that only comes from the heart. Moore & Moore's very popular video “Find Me A Man Like Goober”, featuring George “Goober” Lindsey and cameos of 17 legendary artists, is a favorite among traditional country fans, and has been added to country video outlets worldwide. Their most recent video release, “Show Me Your Country” has been added to CMT.com, the Heartland Network, RFD-TV, Music Mix USA and many more stations in the USA and Europe. Their latest single, “Summer Love” is climbing the European HotDisc chart. Moore & Moore will be a show not to miss! Twin sisters, Debbie & Carrie Moore have received awards and nominations from Indie Bullet, Airplay International, TNN/Music City News, Business Leader, BMI, NSAI and NATD. Their success has prompted appearances on CBS, NBC, FOX, ESPN, TBS, TNN/Heartland, RFD, GAC, CMT, and the BBC. Moore & Moore have toured extensively with the Statler Brothers and have appeared on the Grand Ole Opry. They have performed in Asia, Australia, Canada and Europe and received the International Duo and International Entertainer of the Year Awards. Debbie Moore co-wrote the #1 Billboard hit, “Wish You Were Here” with Bill Anderson and Skip Ewing recorded by Mark Wills on Mercury Records. Recently, Moore & Moore collaborated with Ireland’s Queen of Country, Philomena Begley for their single release, “Country Girls Never Get Old’ (written by Debbie & Carrie) that is included on Philomena’s 2013 album, “How I Love Them Old Songs”. The song went to #1 on the Country Airplay Direct charts. (Nashville, Tenn. – March 13, 2014) – Country duo Moore & Moore will premiere the video for their new single, “Show Me Your Country,” on their CMT Artist page on Artists CMT Thursday, March 13. The video’s broadcast premiere will take place March 16 on the weekly syndicated television show, “Young Country". The video features the twin sister duo performing with their band in an open country field, along with scenes of the two hitting the road in a classic ’57 Chevy. Many of the scenes from the music video were shot during the duo’s travels in Europe. 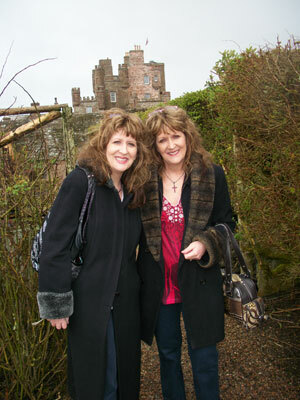 The twin sister duo is made up of Debbie and Carrie Moore from Belton, Mo. Their current album, Show Me Your Country, is now available on iTunes and other major digital retailers. The latest single from the album, “Mississippi Missing You,” is currently #8 and climbing the European HotDisc Chart. Moore & Moore released their first single, “Out With The Old,” in the ‘90s. The song was #1 on the Indie Bullet chart for seven weeks, making it the longest running No. 1 debut single in independent chart history. 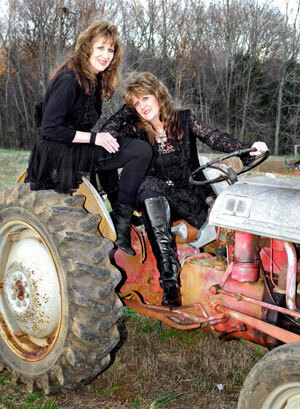 The twin sisters have toured all over the country and all around the world with well-known Country acts, including The Oak Ridge Boys and The Statler Brothers. Throughout their career they have won many awards, including “Country Duo of the Year,” and “International Entertainer of the Year.” The Moore sisters continue to tour both in the U.S. and internationally. About Young Country: Young Country is a weekly syndicated television show featuring America’s hottest country music videos and fascinating interviews of today’s emerging country stars, along with well known veteran entertainers. The show airs in the U.S. and internationally. Based in Tyler, Texas, Young Country can be found on RuralTV, channel 232 for Dish users. The show can also be viewed on cable on FamilyNet, which reaches more than 200 U.S. markets. Nashville, TN (November 4, 2013) – Award-winning country duo, singer/songwriters, Moore & Moore (Carrie & Debbie) will release their new single, “Mississippi Missing You” on November 4. The song is the latest single from their sixth studio album, “Show Me Your Country” on DOV Records. “Mississippi Missing You” is written by #1 Songwriter, Debbie Moore, and is already getting great reviews as “poignant, very melodic and beautifully written”. The song centers around a friend/lover left behind in the shared hometown of Tupelo, Mississippi while the other pursues the dream of opening up a winery in France - probably not the usual country song, but the Moore twins are anything but “the usual”. Twin sisters, Debbie & Carrie Moore have received awards and nominations from Indie Bullet, Airplay International, TNN/Music City News, Business Leader, BMI, NSAI and NATD. Their success has prompted appearances on CBS, NBC, FOX, ESPN, TBS, TNN, GAC, CMT, RFD and the BBC. 'SHOW ME YOUR COUNTRY' IN THE U.S.A.
NASHVILLE, TN (May 4, 2012) - Country duo Moore & Moore rocked the UK with the pre-release of their new CD, Show Me Your Country. 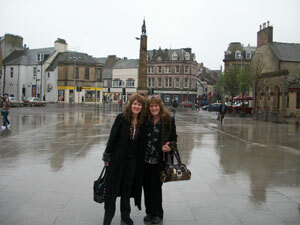 The sassy siblings introduced the album with performance stops in Scotland and England and radio and television interviews with the BBC. Hosting duties were also on the agenda as Debbie & Carrie filmed segments of their new television show in the United Kingdom, also titled Show Me Your Country, now in production, along with an accompanying music video. Twin sisters, Debbie and Carrie Moore, have received awards and nominations from Indie Bullet, Airplay International, TNN/Music City News, BMI, NSAI, and NATD. Their success has prompted appearances on CBS, NBC, FOX, ESPN, TBS, TNN, GAC and CMT. They have toured extensively with the Statler Brothers and have appeared on the Grand Ole Opry. They have performed in Asia, Australia, Canada and Europe and received the International Duo and International Entertainer of the Year Awards. Debbie Moore co-wrote the #1 Billboard hit, "Wish You Were Here" with Bill Anderson and Skip Ewing recorded by Mark Wills on Mercury Records. Moore & Moore’s album, “Million Roses”, with special guests, Bill Anderson, Shawn Camp, the Jordanaires and Jerry Reed, received rave reviews and an Airplay Gold Record “for Radio Report Points and Overall Industry Acceptance”. Moore & Moore’s previous album, “Meant To Be”, with special guests, Jan Howard & Jeannie Seely, George “Goober” Lindsey, Pirates Of The Mississippi and Johnny Rodriguez, was nominated for Country Album Of The Year by the Independent Music Awards. Their single/video “Find Me A Man Like Goober”, received enthusiastic reviews, including Music Row Magazine’s Robert Oermann claiming “Their twin-like vocal harmonies are absolutely perfect, and the bopping song is as cute as the dickens”. The accompanying video, featuring George “Goober” Lindsey and cameos of 17 legendary country artists, has been added to country video outlets worldwide.